As is the custom in Norfolk my Valentine’s cards to my family are in the post, pretending to be from Old Father Valentine. I cannot knock on the door and leave them on the doorstop before running and hiding, as I should do, so I wrote “Knock! Knock!”, just as I always do, on the envelope. The picture at the top of this posting is the Valentine's card that my Mum sent to me every year for as long as I can remember. After I left home I would always take it back to her on my first visit after February 14th. I would place it in her mother’s old desk on the shelf where it belonged, where I knew she would find it the following year to send to me once again. The last time that I took it home was on the visit in June 2008 when my Mum died, so I brought it back again to Germany and hung it on the wall where it now remains all year round! 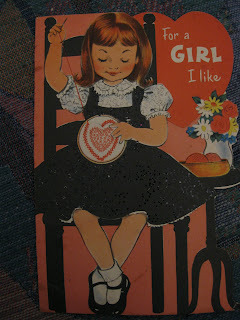 There is another old Valentine’s card that has done the rounds in the family. It has travelled much further afield than my card has. This is the card that my Mum sent to my Great Uncle who was in the Royal Mounted Police Force in Canada. I remember choosing that card with my mum. I was very young at the time, perhaps four or five years old. My Mum and her uncle then started to do the same as she did with me, he quite spontaneous sent the card back. That is how it went on for years, back and forth in the post between Norfolk and Ottawa, never getting lost. I loved it when this card arrived on our door-mat. It opened out from a six-inch square to a huge poster. This was like magic to me when I was young. When on the following Valentine’s Day I sent this card back to my Mum she realised we were in for the long haul and not once did one of us mislay it or forget. After my Mum died I had the card here with me in Germany so last year I sent it to my sister! I think she has caught on too, since I suspect that it is enclosed in the envelope that arrived this morning. It is on the kitchen table ready to be opened when I get up. I do so hope that I am right. Watch this spot. If I am right I will post a photograph later. I just had to include the second photograph heading this blog. 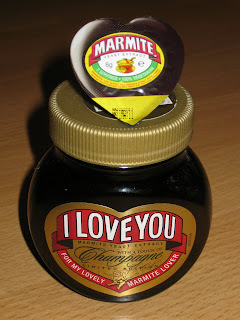 Both examples are presents from friends who know that I love Marmite. I love it best of all as thick as possible on hot, buttered toast eaten at midnight!